The smell of freshly baked croissants…. You might think such an experience could only come from living above a bakery in France, but there is this amazing little bakery close to where we live and they have the BEST croissants. So, while trying to stop myself from buying these oh so good croissants (they are a little pricey and I need to stop myself from grabbing them every single morning), I decided that as a reward for not giving in to my croissant desires, I need to bake something with croissants over the weekend. So, I needed a simple, summery, breakfasty, cake-like-but-not-dessert-like recipe to make, and seriously, who doesn’t crave having a good, seasonal, berry cake recipe in their morning-treat repertoire ? The first thing I look for a solution is the internet. My favorite food blogs, Pinterest or Facebook are all full of breakfast-y related recipes…..and to make a long story short I decided to make a small tweak and instead of just blueberries, add an raspberries too. It is absolutely WONDERFUL! For me, croissants with anything in the morning is a winner- and blueberry and raspberry combination is seriously so light, delicate, simple and but still had that custardy texture. Place croissant pieces in a 9x13 pan. 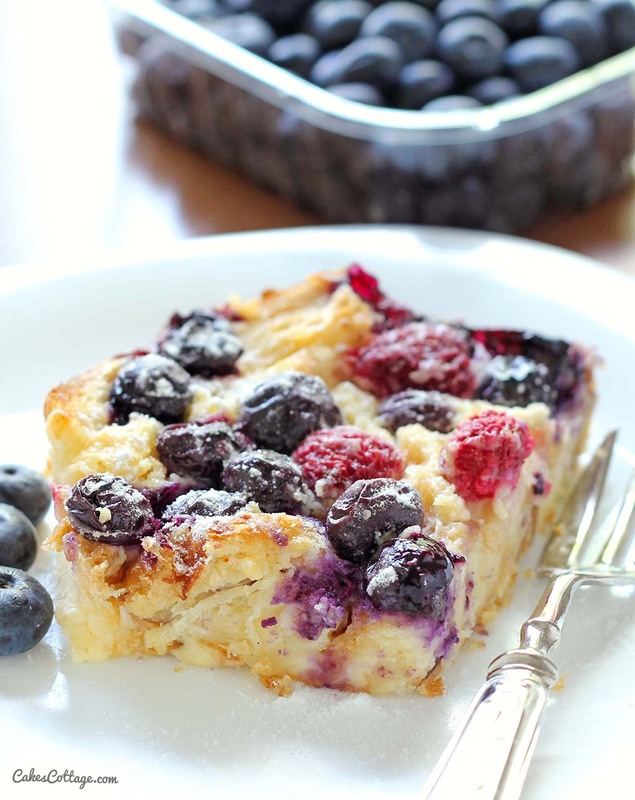 Scatter the blueberries and raspberries over the top. Beat cream cheese, sugar, eggs and vanilla in medium bowl with electric mixer on medium speed until well blended. Pour evenly over croissant pieces. Let stand for 20 minutes. Bake for 35 min or until set in centers and golden brown. This entry was posted in Breakfast, Cakes and tagged Blueberry, croissants, raspberry on June 20, 2015 by Dan. When I try these I will re leave a comment. Thank you for sharing . This looks so delicious! Adding it to the list to try soon. Thanks for linking up with What’s Cookin’ Wednesday! I’m going to try this it looks really good, thanks for sharing…. I found this recipe last week and made it this morning and HOLY COW I ATE HALF THE PAN MYSELF. So delicious. I loved every bit! Great recipe! What wonderful recipes ! Can hardly wait to try the stra.wberry salad Um m m ! I loved this recipe it came out great! Thank you for this idea! The only reason I gave it 4 stars is that it def did NOT need 1 cup of sugar. That sounded like way too much, so I used 1/3 cup and it came out great. Especially since the fruit is already sweet. So beware of the 1 cup of sugar, because you can definitely use 1/3 cup & it is def sugary enough with that along with all the fruit. I’m making it for the 2nd time today and this time only using 1/4 cup of sugar.